As 2012 drew to a close, NASA’s Curiosity Mars Science Lab (MSL) rover celebrated her first Christmas on the Martian surface and a resoundingly successful initial five months of exploration since the pulse pounding and unprecedented sky crane rocket powered touchdown on Aug. 6, 2012 inside Gale Crater beside a towering, layered mountain named Mount Sharp. Meanwhile her older, smaller sibling Opportunity will soon celebrate an unfathomable nine Earth years on Mars on Jan. 24, 2013 – on the other side of the planet. 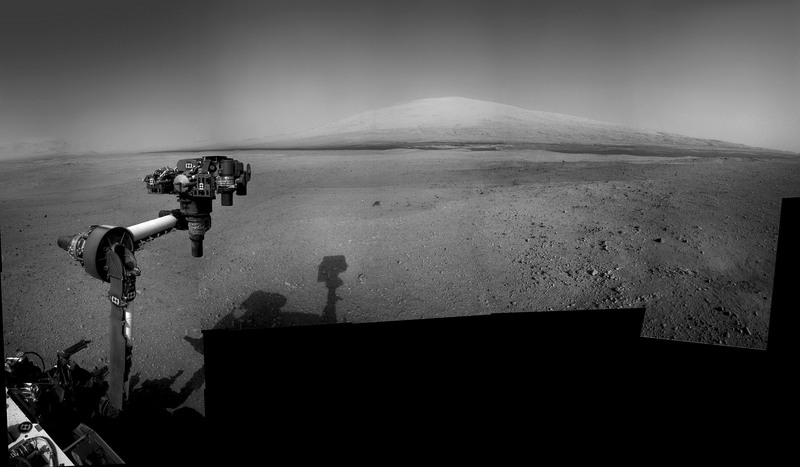 At this very moment, Opportunity is investigating a spot inside Endeavour crater that is the most scientifically bountiful terrain yet of her entire incredible mission. It also promises to help unlock the mysteries of the Red Planets evolution from the warm, wet world of billions of years ago to the cold, arid landscape of today. Curiosity has already made significant science discoveries in her short lifespan on the Red Planet and is in excellent health for the exciting journey’s ahead in 2013. Locating the first drill target is the near term goal in January 2013. “That first drilling will be a huge moment in the history of Mars exploration,” says John Grotzinger of Caltech, the project scientist for Curiosity. At year’s end, Curiosity was working at a spot called Yellowknife Bay. The SUV sized robot reached the shallow depression on Sol 130 (Dec. 17, 2012) after descending about two feet (0.5 meters) down a gentle slope inside a geologic feature dubbed Glenelg – selected by the MSL team as the rover’s first major science destination for extended investigation. She has already snapped over 35,000 images using the 17 on board cameras – including an amazing self portrait on Sols 84 & 85 at a windblown ripple dubbed Rocknest. See our panoramic mosaics herein from Yellowknife Bay, Rocknest and other stops along Curiosity’s traverse route for a context view. Just days before on Sol 120 (Dec 7, 2012) she stopped to inspect a huge outcrop of layered rocks dubbed Shaler and collected dozens of high resolution photos with the Navcam and Mastcam cameras. The Shaler outcrop features a plethora of striking layers, angled to each other in a pattern geologists refer to as ‘crossbedding’. The robotic arm was first flexed on Aug. 20 and dramatically pointed the way to Mount Sharp with the hand like tool turret – see our Sol 14 composite photo mosaic featured by NASA’s Astronomy Picture of the Day (http://apod.nasa.gov/apod/ap120827.html) on 27 August 2012. Since then she’s been on a roll to reach the inviting interior terrain of Glenelg before Christmas. 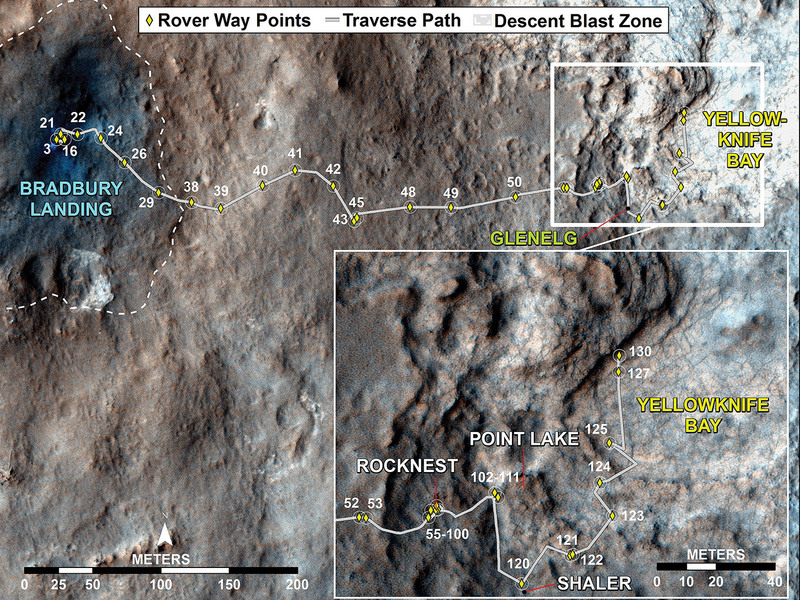 Glenelg is a geologist’s paradise and uniquely sits at the junction of three different types of intersecting geologic features that will help unravel the secrets of the touchdown zone beside the humongous mountain Mount Sharp – the main destination of the mission. Thus far the six wheeled robot Curiosity has traversed a total driving distance of some 0.43 mile (700 meters) and is now roving atop the most challenging and scientifically rewarding terrain of the entire five month journey. The science and engineering team guiding Curiosity is commanding her to accomplish ever more sophisticated and bold forays across the crater floor. Along the short route travelled during the first 150 Sols, or Martian days, of the mission Curiosity already made the key science finding – namely the discovery of evidence for an ancient Martian stream bed at three different surface locations. Curiosity found a trio of outcrops of stones cemented into layers of conglomerate rock – initially at the landing site and later while driving. The outcrops are named Goulburn, Link and Hottah. These findings show that hip deep liquid water once flowed vigorously on the floor of Gale Crater billions of years ago and validates the choice of Gale Crater as the landing site. Liquid water is a prerequisite for the origin of life. The $2.5 billion robot is the biggest and most sophisticated robot ever dispatched to the surface of another world and represents a quantum leap in capability. “Curiosity is NASA’s first astrobiology mission to Mars since the Viking landers back in the 1970’s,” says Mike Meyer, Chief Mars scientist at NASA Headquarters in Washington, D.C. The 10 foot (3 meters) long mini Cooper sized Curiosity is loaded with 10 state-of-the-art science experiments weighing 15 times more than any prior roving vehicle. Some of the tools, such as the ChemCam laser-firing instrument for checking rocks’ elemental composition from a distance of up to 25 feet, are the first of their kind on Mars. The one ton mega rover is tasked with searching for the signatures of life, including organic molecules – the building blocks of life as we know it. To enable the hunt for organics and determine the composition of Martian samples, Curiosity is equipped with a drill and scoop located at the end of its robotic arm, to gather soil and powdered samples of rock interiors. It will then sieve and parcel out these samples into the rover’s high powered analytical laboratory instruments on the mobile rovers’ deck. 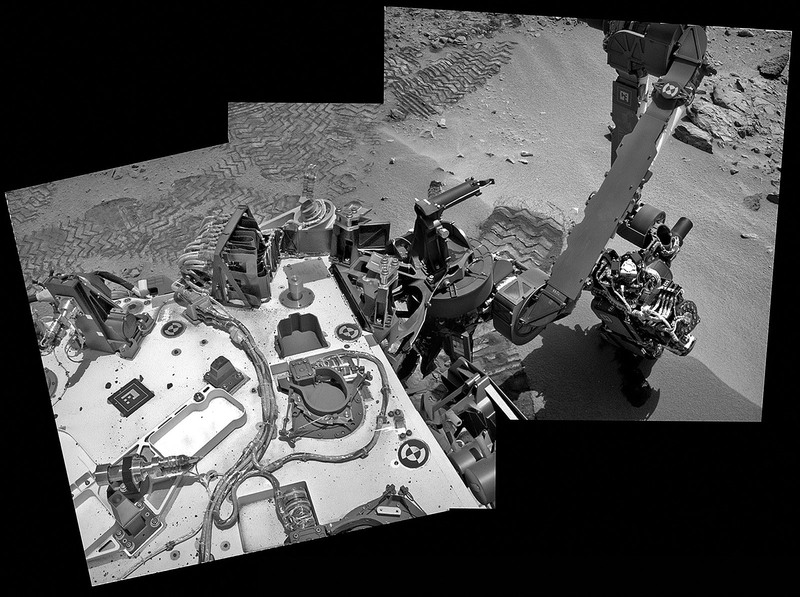 During Autumn 2012, the rover made an intermediate stop of several weeks at the Rocknest ripple to check out and clean the sample handling mechanisms and then collect the initial scoops of sand to ingest into the chemistry labs. January marks the five month anniversary of her toiling on the spectacular Martian surface since the hair-raising pinpoint touchdown at the foothills of the gorgeous layered mountain holding deposits of hydrated minerals that may be the key to understanding Mars watery past and four billion plus years evolution. The science team is now searching for an interesting rock for the inaugural use of the high powered hammering drill located on the turret at the terminus of the seven foot (2 meter) long robotic arm. The initial drilling had been planned for December but was delayed until after the holiday season due to concerns that frictional heating may potentially cause liquification of the rock to a gooey substance that could potentially clog the sample handling sieves and mechanisms. So the team is carefully re-evaluating which rock to target and the operating procedures for the percussive drill before committing to its initial usage. The team chose to drive to Yellowknife Bay because it features a different type of geologic terrain compared to what Curiosity has driven on previously. Curiosity arrived at the lip of Yellowknife Bay on Sol 124, entered the basin on Sol 125 (Dec. 12) and snapped a scouting panoramic view peering into the inviting locale. Another top priority was to acquire a high resolution 360 degree Mastcam color panorama. This will be invaluable for selection of the very 1st rock target to drill into and acquire a sample from the interior – a feat never before attempted on Mars. The rover is also using the APXS X-ray mineral spectrometer, ChemCam rock blasting laser and MAHLI hand lens imager to gather initial science characterization data of Yellowknife Bay. After a careful selection process, the team expects to choose the drill target sometime in January 2013 and use the robotic arm to deliver that initial, pulverized rock sample to inlet ports on the rover deck for analysis by the high powered duo of miniaturized chemistry instrument labs named Chemin (Chemistry and Mineralogy) & SAM (Sample Analysis at Mars). CheMin and SAM will help elucidate the inorganic mineral composition as well as seek to determine if any organic molecules are present. SAM is specifically engineered to search for organic molecules using a Gas Chromatograph and Mass Spectrometer (GC-MS). CheMin uses X-ray diffraction techniques to accurately determine the mineralogical composition of pulverized and sieved red planet soil and rock samples. Curiosity will spend at least another month or more investigating Glenelg before setting off on the nearly year long trek to her main destination – the sedimentary layers of the lower reaches of the three mile (5 km) high mountain named Mount Sharp. Along the way, the science team may possibly choose to re-investigate the Shaler and Hottah outcrops with the rover’s suite of science instruments. As the Martian crow flies, the environs of Mount Sharp are some six miles (10 km) away. Curiosity will have to carefully navigate across a treacherous dune field to get there. The team projects it will take about a year or so before Curiosity arrives at the base of Mount Sharp and begins the ascent in between the breathtaking mesas and buttes lining the path upwards to the sedimentary materials. Climbing Mount Sharp and exploring the embedded water related phyllosilicate clays and sulfate minerals are the ultimate goals of Curiosity’s mission. Scientists are searching for evidence of habitable zones that could have supported Martian microbial life -past or present – during the two year primary mission phase. Gale Crater is unlike anything we’ve seen before on Mars.